‘The 33’ Trailer Looks Fantastic!!! 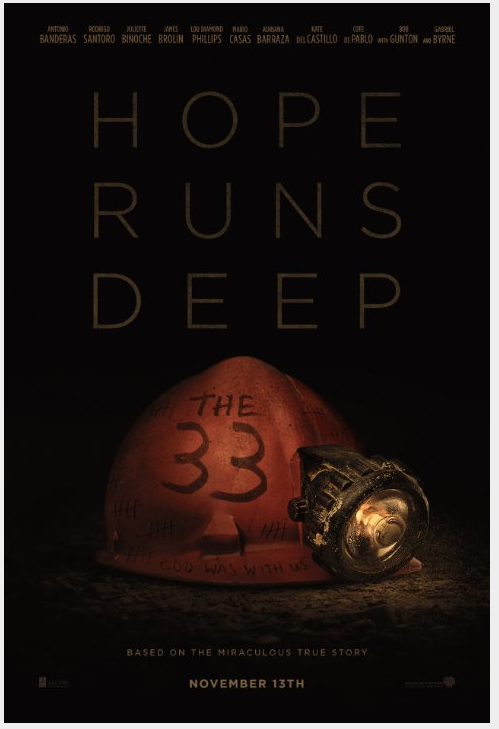 ‘The 33‘ is Antonio Banderas’ latest passion project, he stars as Mario Sepulveda, the public face of the trapped Chilean miners who were caught in a disastrous situation in 2010 which led to 33 men being trapped for 69 days at the bottom of a gold and copper mine in Copiapo, Chile. Héctor Tobar was in contact with the miners while they were still trapped and all 33 chose to collectively contract with a single author to write an official history so that none of them would individually profit from the experiences of others and they chose Tobar to tell their story, it was published in 2014 as ‘Deep Down Dark: The Untold Stories of 33 Men Buried in a Chilean Mine, and the Miracle That Set Them Free‘. Director Patricia Riggen (‘Girl In Progress‘) tasked Mikko Alanne and José Rivera, Michael Thomas and Craig Borten (‘Dallas Buyers Club‘) with adapting the novel to a screenplay. Banderas is joined on screen by Lou Diamond Phillips, Juliette Binoche, Gabriel Byrne and Rodrigo Santoro. The first trailer has landed and the film hits theaters on November 13. ‘The 33’ Will Be Available to Purchase in February!!! This entry was posted on Wednesday, July 29th, 2015 at 11:58 pm	and is filed under Books, Film, News. You can follow any responses to this entry through the RSS 2.0 feed. You can skip to the end and leave a response. Pinging is currently not allowed. « Mel Gibson Set To Direct First Film In 9 YEARS With ‘Hacksaw Ridge’!!! !